Easy for him to say, I thought, with my heart pounding and every muscle in my body resisting what my brain was (unconvincingly) asking it to do. I closed my eyes and ever so gingerly pushed off. Instantly I was in free fall. Then the rope attaching me to the zip line jerked tight and sent me hurtling down the slope at an alarming speed. I careened down the zip line until the slope flattened and, thankfully, slowed my speed. I oscillated back and forth a few times until the instructor raised a ladder. Gratefully I descended and kissed terra firma, vowing never to part from her again. But the instructor paid no heed. “If you thought that was rad, you’ll love rappelling,” he said leading me toward a sheer, hulking cliff. I was sampling but a small part of the smorgasbord of activities offered at Strathcona Park Lodge. Located in the centre of Vancouver Island on the eastern boundary of Strathcona Park — British Columbia’s oldest — the Lodge is surrounded by peaks soaring to 7000 feet, sparkling alpine lakes, dense forests of fir and cedar. It is the perfect base to enjoy outdoor activities, explore nature and, as I learned, test your personal limits. The Lodge, a rambling collection of log cabins and chalets sprawling on a slope down to Lake Buttle, is home to students, visitors, and about 70 instructors. During my stay the laughter and enthusiasm of about 240 young students bubbled through the forest like a heady froth. Started by Myrna and Jim Boulding in 1959, the Lodge continues today as a warm, family operation where people and human values are more important than the bottom line. 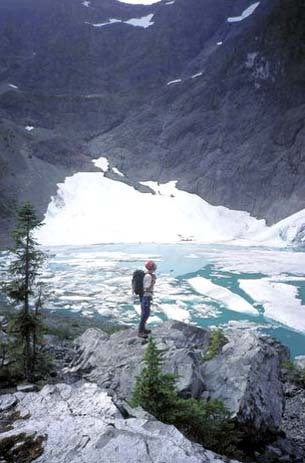 The original offerings grew into a comprehensive apprenticeship program (Canadian Outdoor Leadership Training Program) for those embarking on a career in outdoor education and leadership. It is considered the premier training centre in Canada and is recognized worldwide for its excellence. Over 1000 young leaders have received their training here. This is a good thing for adventure tourism is booming across the globe, and Canada, and especially British Columbia, are well positioned to take a large bite out of the pie. In the face of enthusiastic demand the Lodge widened its horizons and now offers adventure, nature, or just plain relaxation to all ages at all skill levels. One morning I watched a 67-year-old woman and her nine-year-old granddaughter deep in an animated conversation as they paddled a canoe out to explore a small island. 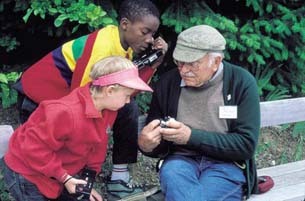 Part of the grandparent-grandchild program that the Lodge pioneered with Elderhostel, it is one of many examples of how the Lodge focuses on character development rather than offering all-you-can-consume hedonism. 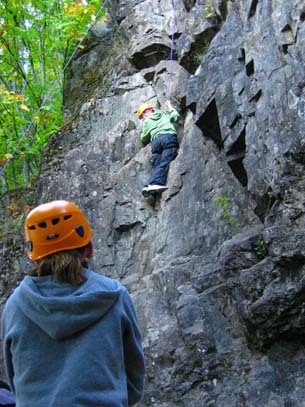 As I quickly learned, outdoor activities are at the heart of any vacation here and one can select from rock climbing, kayaking, canoeing, natural history, wilderness survival, orienteering, mountaineering and more. The challenge is what to choose from the enormous selection. And it’s not about boring classes; instead it’s all about active participation ranging from a quiet paddle, to pulse-thumping rappelling, to scaling a snow-capped mountain. 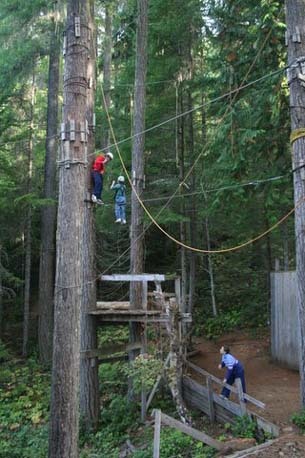 I watched a group of grade-eight students negotiate the high-rope course, carefully working their way across sections called Leap of faith, Ninja’s Crossing, and Burma Road. It was good to see their initial nervous giggles and apprehension turn to confidence as they progressed. At the sheer cliff where they were rock climbing and rappelling, I saw the students encourage and support each other, even when the occasional one could not conquer their fear. 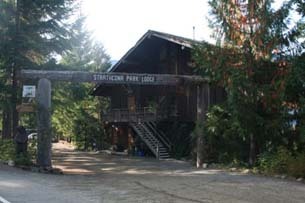 Although Strathcona Park Lodge keeps a low profile (with almost no advertising budget), it has not gone unnoticed. The Lodge has received several education and environment awards, but perhaps the most meaningful recognition is the prestigious Heaslip Award for Environmental Stewardship that Jim and Myrna Boulding received in 1986 from the United Nations Environment Programme. That evening, sitting on the porch of my cabin, I watched the sun set over the lake with the mountains forming dark soft shadows against the mauves and pinks of the sky. Only two days had passed, but I already felt a better person. To book a stay or learn more about the Lodge, including its alpine chalets at Mt. 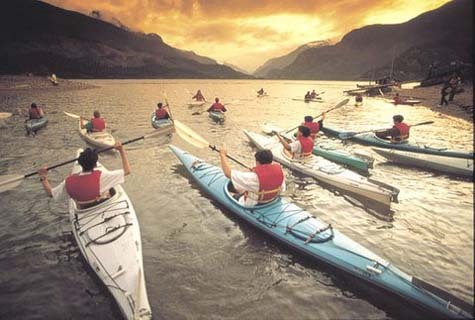 Washington Alpine Resort and sea kayaking and ocean canoeing in Nootka Sound, visit www.strathcona.bc.ca. 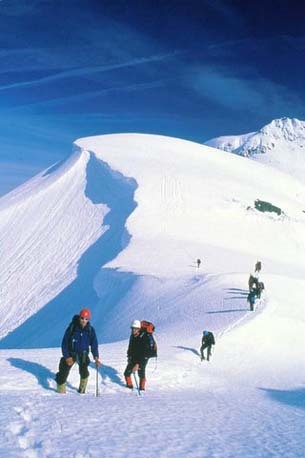 To learn about or enroll in the Canadian Outdoor Leadership Training Program visit www.colt.bc.ca. 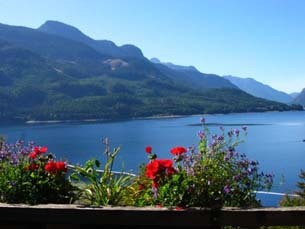 Click here for information about Strathcona Provincial Park: and visit www.strathconapark.org.